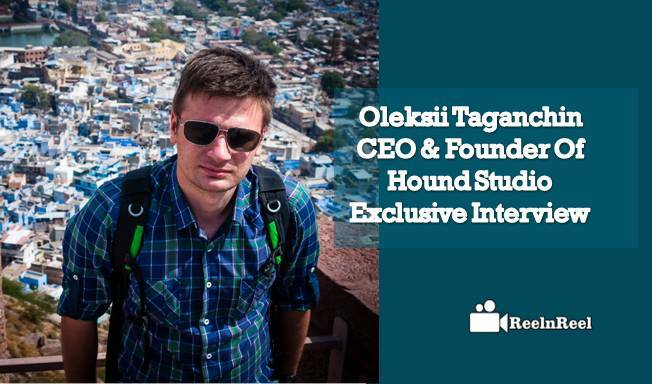 Reelnreel.com Exclusive Interview with Oleksii Taganchin – CEO & Founder of Hound Studio. Tell us something about your Company Hound Studio? What are Hound Studio services? What are the latest Trends in Online Video? What are Hound Studio motion graphics & explainer animation production Services? Tell us something about your Hound Studio process with respect to Video Production? What is Hound Studio Success Model? What are the Latest Hound Studio Services that can help brands? Hi, my name is Oleksii. I’m founder of Hound Studio. Thank you for the interview. I will be glad to answer all your questions. At this moment Hound Studio is small team from Ukraine. We love animation, design and everything related to art. In our team, creative designers and animators work who believes that art is making our life brighter. So Hound studio is not about the dog it’s about the talented people working together. We make 2d explainer videos, 3d commercials and a custom web-design. It includes development of design concept, script writing, storyboarding, animation and sound design. So we are trying to take care of every step of animated video production. ● Videos on Landing Pages or websites – it’s main trend. People now understand that it’s much easier to attract potential clients to products or services with short animated video. People are busy and have no time for long reads anymore. You have just a few mins of their attention in a best case. So that is why explainer videos work so well. ● Videos in email marketing – all of us receive dozens of emails with information about services, sales and so on. Most of them will never be read because you send them to the trash once you get it. That is why animated header is the trend of last year. Again it attracts the viewer and your letter has a chance to be noticed. An animated explainer videos are short on-line videos used to explain your company’s product or service. They are often placed on a landing page, website’s home page, or a prominent product page, and have become extremely popular – some sites boast of conversion rates increasing by as much as 144% after including an explainer video on their website. We offer our clients to make unique and creative explainer videos which goes beyond the limits. It looks different and is not restricted by casual styles. Making unique product is our main goal. Creative brief is the key to success of the perfect explainer video, filling it in be as accurate and precise as you can. Now having your creative brief we can start old faithful brainstorm with a lot of coffee and good ideas for the future video. Then a storyboard is prepared sketching out the script in visual form. All the scenes are shown with detailed description, explaining each action and movement that will take place in the video so the client can see the “sketch” of the future video and in case of need make the changes. Preparing of the storyboard allows to save time for any further changes which may be critical if the deadline is tight. Then we select voice over artist (either from our library or the artist preselected by the client) who narrates the script. On this stage we create environment scenes and characters. Next is the animation, which is the most time consuming part. And last but not the least stage is when all sounds (including the music, voice-over, and sound effects) are mixing together to fit the animation. For Nora explainer video we have created a totally custom soundtrack to make the best impression with great sound effects and music. Voila! You have your unique explainer video. There is no something new for our studio. This year we are going to work even more, learn new techniques, create new unique design and improve our 2d and 3d animation video services. We offer custom design to our clients to highlight their brands and make them noticeable in such fast world of innovations. We offer not just animation for a website but website and corporate design as well. We also have corporate blog http://hound-studio.com/blog where we share some interesting articles related to our production and internal projects. Thank you Oleksii Taganchin for sharing your valuable inputs for Reelnreel.com readers. What is Sequential Video Advertising ?